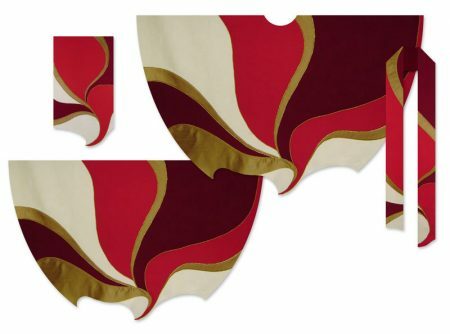 The design for this four-piece collection of vestments and paraments employs abstract imagery reminiscent both of Pentecost flame and Baptismal dove to celebrate the Spirit’s empowerment of God’s people in every time and place. 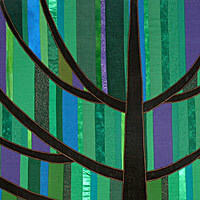 The design’s contrasting colors reflect manifold manifestations of the Spirit’s activity within and beyond the Church. 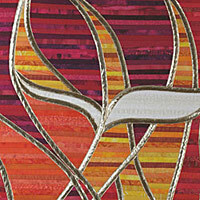 The irregular borders of the pieces serve as a reminder that the Spirit cannot be controlled, predicted, or contained. The design was executed using synthetic, metallic, silk, and ultra-suede fabrics, then embellished using couched gold cording. The collection is used on the Feast of Pentecost, Reformation Sunday, on days when church martyrs are remembered, and when clergy, pastors, priests, and deacons are ordained or commissioned for ministry.